When most North Carolinians think of a lady slipper orchid they picture the native pink Cypripedium growing throughout our Smokey Mountains. However, did you know that the lady slipper is also a type of orchid that grows naturally on six continents? Orchids come in all shapes and sizes. 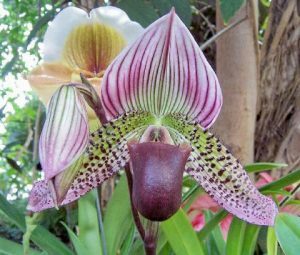 The lady slipper (Paphiopedilum-also called paph) is native to southeastern Asia and a special addition to any household or orchid collection. Lady slipper orchids come in a wide range of colors and color combinations. Combined with a distinctive pouched lip, these are guaranteed to add drama to any kind of arrangement. Like the Phalaenopsis orchid, it has become one of the most popular ways to bring natural beauty into the home. So what makes a lady slipper so unique? Lady slippers are a sympodial terrestrial orchid, meaning they grow on the ground and have multiple growing points. Lady slippers grow horizontally as opposed to the Phalaenopsis orchid, which is monopodial and grows from a single stem increasing in height with age. Lady slippers’ terrestrial roots are short, thick, and spongy and their leaves are thin and often mottled, making them very attractive even when not flowering. In general, green-leaved paphs prefer cooler temperatures while mottled-leaved paphs prefer warmer temperatures, but both are very adaptable. They can withstand temperatures down to 40 degrees and temperatures as high as 90 degrees. With their short root systems, lady slippers are perfect for a person who tends to over water plants as these lack pseudobulbs and need to be watered twice per week. As with most orchids, be sure not to water at the center of the plant as this can cause crown rot. This being said, they do like to dry out a little in between waterings. Lady slippers should be repotted every year after blooming in a fine-grain bark mixture that allows good drainage. 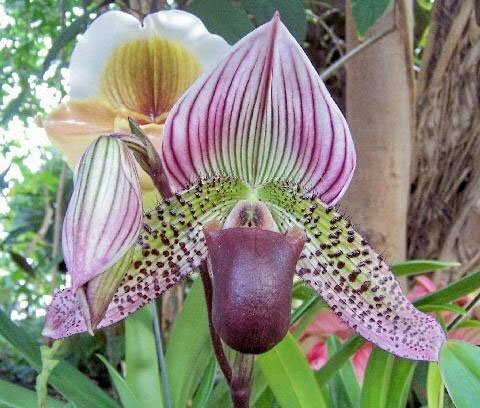 Since paphs are terrestrial orchids they are happiest growing in shade or medium light. Morning sun is the best. Fertilize on a regular schedule with a 20-20-20 fertilizer during the winter, and a high nitrogen fertilizer during the warmer growing months. 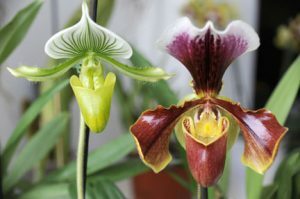 Many Paphiopedilums can produce several flowers over the course of a few months so wait until the blooming spike turns brown before cutting it off. Make sure to stake the bloom while growing to prevent the weight of the bulb from bending the stem. Once the bloom is opened, a cooler temperature around 65 degrees can help prolong the bloom, which should last for two months. While some may argue that lady slippers tend to be a bit temperamental, with the right light, water, and fertilizer they are an easy tropical orchid for anyone to grow. Their colors are striking and the foliage is a decoration all in itself. Be forewarned, after bringing one home, you may find yourself addicted to this orchid. Photos courtesy of Atlantic Avenue Orchid and Garden. Christian Sloan enjoys caring for orchids both at home and while working in the greenhouse at Atlantic Avenue Orchid and Garden in Raleigh.